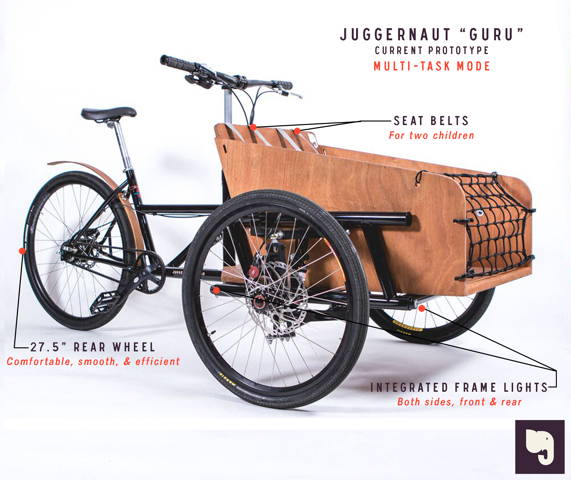 The Juggernaut Cargo Bike has three wheels, carrying capacity of 300 pounds and durible frame. A “Juggernaut” is a powerful force, and our prototype has proven this name to be a perfect fit. Quality components and manufacturing methods make this bike unstoppable. To ride it is to love it! A smooth, well balanced ride let’s you confidently move your cargo. Everything, from tools to terriers, is more fun to haul on our cargo bike! Our rod and plate steering and undercarriage framing assures drivers can easily navigate turns and steer with confidence. Our Cargo Bike prototype has two different modes. “Truck” mode (seen in the previous photos) or “Multi-Task” seen here. This mode allows for infinite transportation options. We want to take Juggernaut Cargo Bikes to the next level, enabling it to truly be an effective alternative mode of transportation, proving that 3 wheels wheels can be better than 4! Internal derailleur system, reduce overall maintenance by enclosing a series of cogs within an oil-bath chamber. Juggernaut Cargo Bikes are Colorado made three wheel cargo bikes that are designed for durable transport. The Homepage should navigate you throughout the Juggernaut Cargo Bike Website.